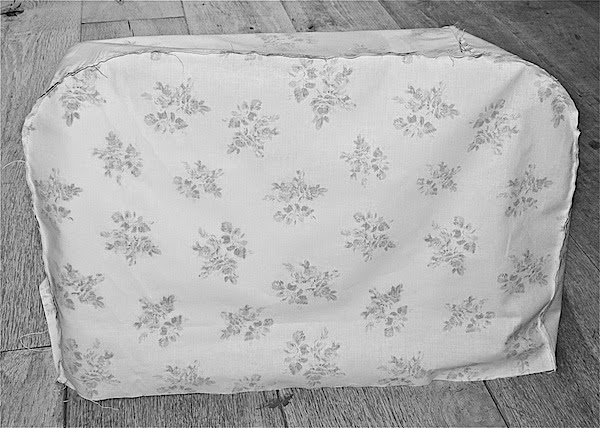 A Version 1 pattern for my Vintage Caravan Sewing Machine Cover is now available. I am hoping to release the final version for sale, together with these instructions, in a few weeks but, in the meantime, you can download it for 50p The final version has been released and now costs £4.00 in my Etsy Shop. I had planned to offer it free but I discovered when I came to list it that Etsy doesn’t allow that. 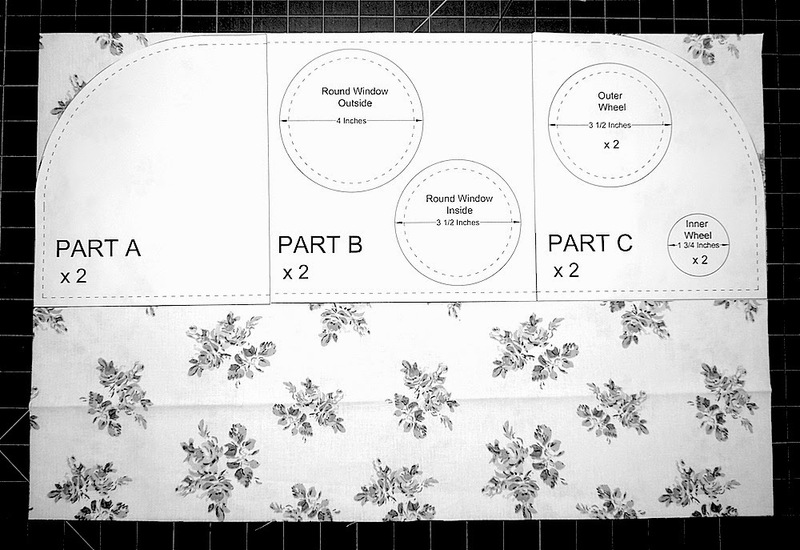 This pattern has not yet been tested, except by me in the making of this tutorial, so This pattern has now been made by a large number of independent sewists so I’m confident everything should go smoothly but if you come across anything that doesn’t make sense or doesn’t work as expected please contact me and we will try to resolve it. The basic construction is very simple but to enable the finished cover to be free standing I have used three layers of Hobbs Fusible Wadding. This means there is a LOT of thickness to sew through. 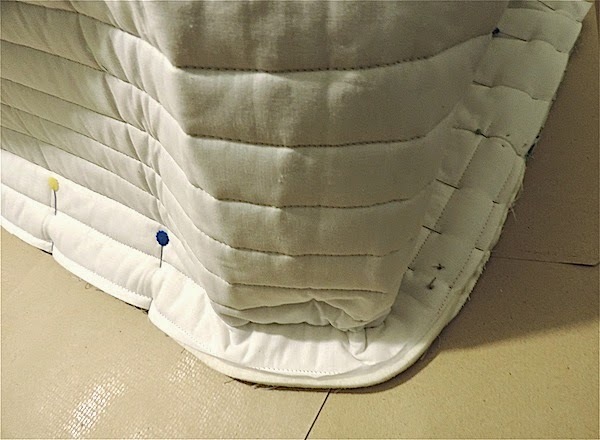 A walking foot is essential and I strongly recommend that before you begin you test the viability of sewing through six layers of wadding + four layers of fabric on your machine. 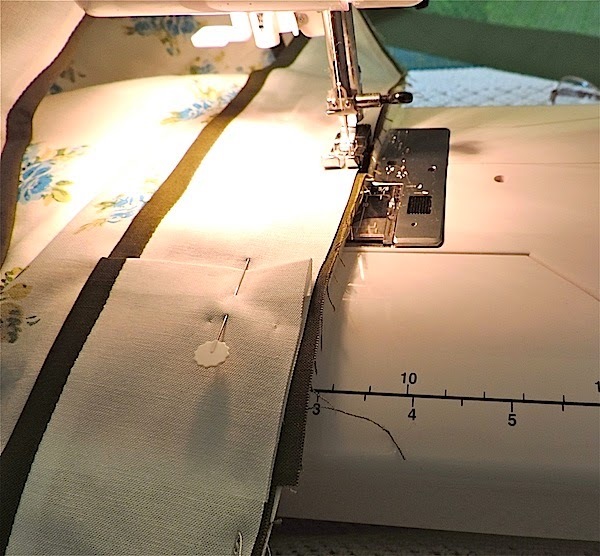 I have Janome Sewist 525S and it was possible but not easy. 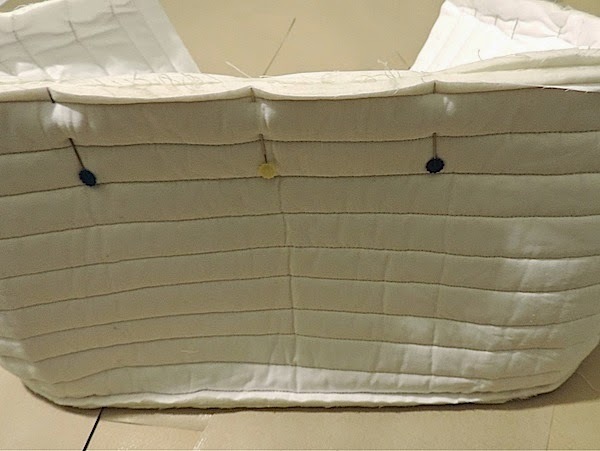 If you find the thickness too much, you can (a) use two layers of wadding, (b) use wadding + a layer of heavy duty interfacing and/or (c) reinforce your main structure with further wadding or interfacing after you have completed Stage Six. 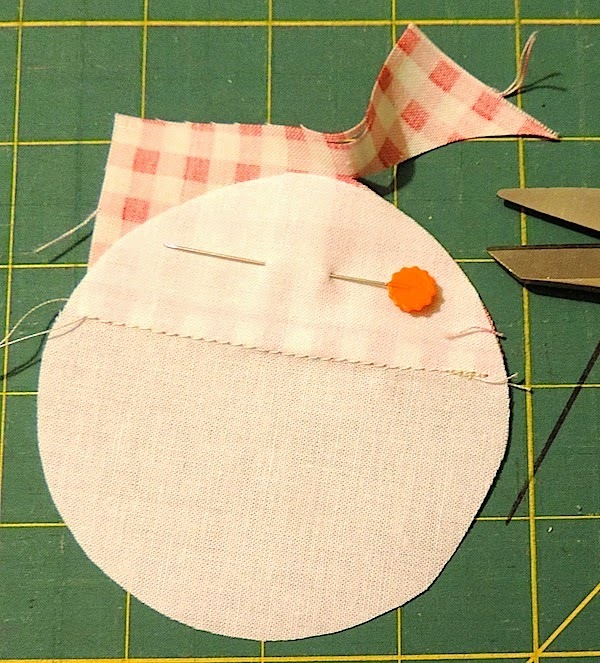 I would very much appreciate any suggestions for improving stitchability without compromising sturdiness or, indeed, any other feedback you may have. Please leave your email address or a link to a social networking site where I can contact you if you leave a comment or question unless you are absolutely 100% certain you are not a noreply blogger. 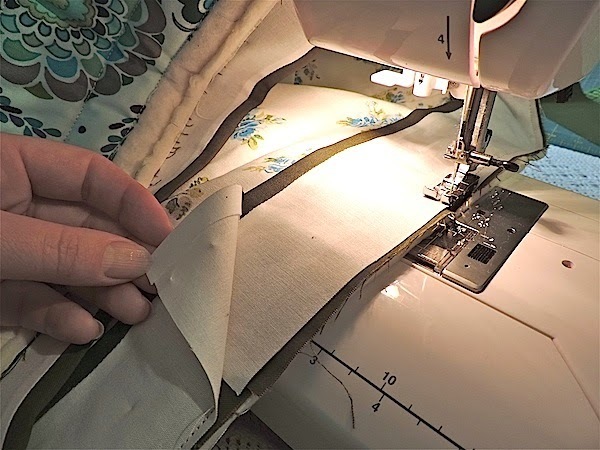 I recommend beginning with the lining because it acts as a rehearsal for sewing the final pieces without having to worry about the thickness of all the layers and because you can use it to make sure the cover will actually cover your machine comfortably. 1. 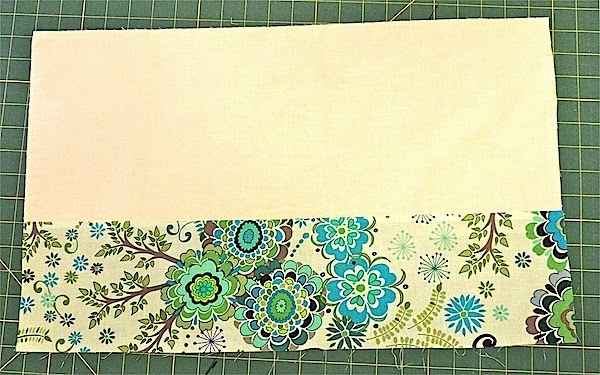 Cut one strip of fabric 42 1/8″ X 9 1/2″. If you need to make a join in this strip, I recommend that you don’t have your join fall on a curve. Set aside. 3. Align pattern pieces A, B and C with the side and top edges of the rectangles you cut in step 2 (above) and cut curve as illustrated below. 4. Mark the centre of each main piece and the strip with pins, as illustrated below. 5. 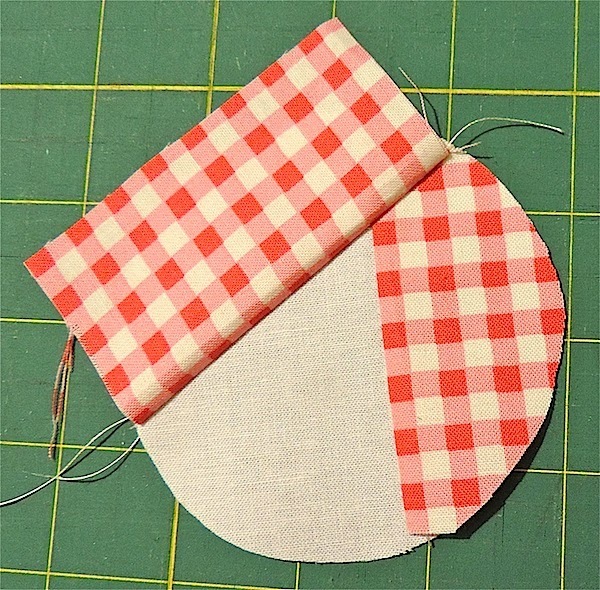 With right sides together, align the pins of one main piece with the pin on one side of the strip and, beginning at the centre point pin and sew. 6. Repeat with the other side. Do not turn right-side-out. Press and set aside. 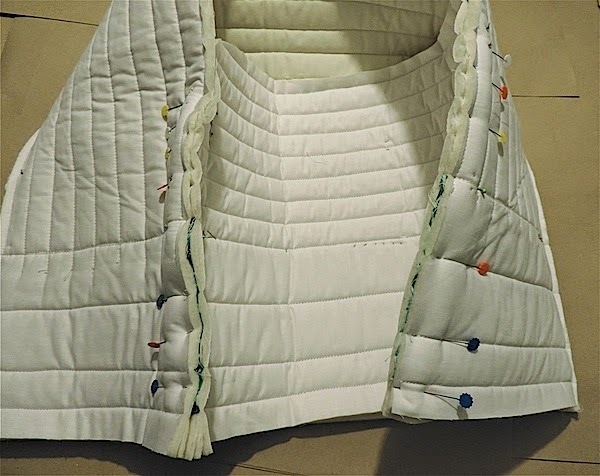 Please note that the fabrics in this stage are cut larger than the pattern pieces indicate to allow for any shrinkage/distortion when the layers are quilted so you can go a little into your selvedges as long as you remember to cut them off later. The main body of the caravan is very thick to enable the cover to stand by itself. 7. 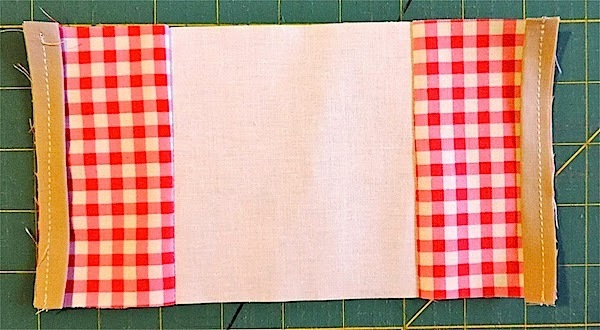 Cut two rectangles of backing fabric 22″ X 15″ and one strip of backing fabric 44″ X 11″. 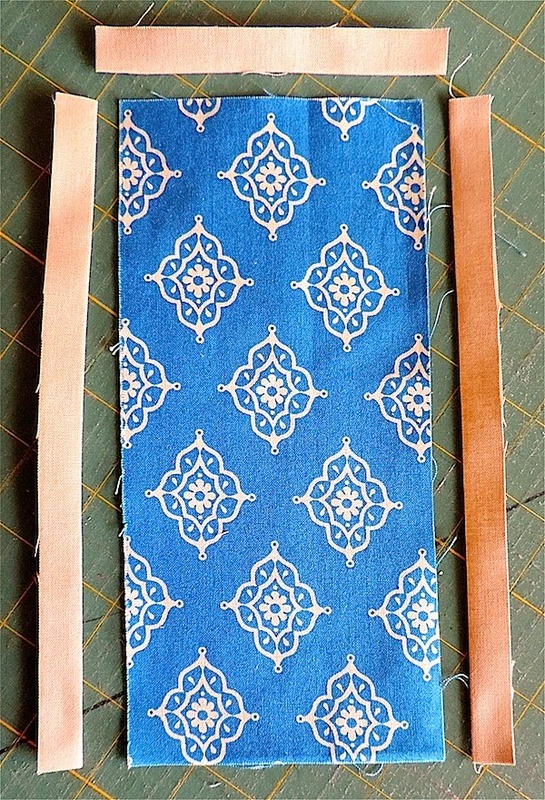 If you are using standard 42″ wide fabric you will need to make a join in this strip. I recommend that you don’t have your join fall on a curve. Set aside. 8. 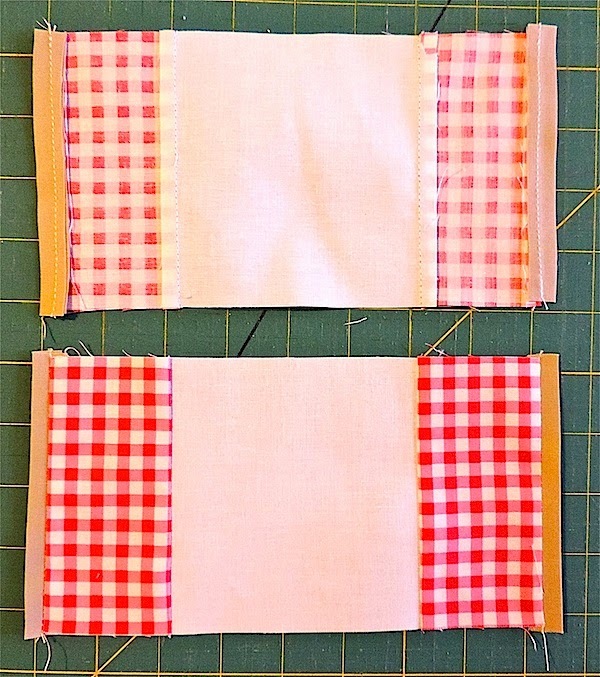 Cut three strips of wadding 44″ X 11″ and six rectangles of wadding 22″ X 15″ Set aside. 9. 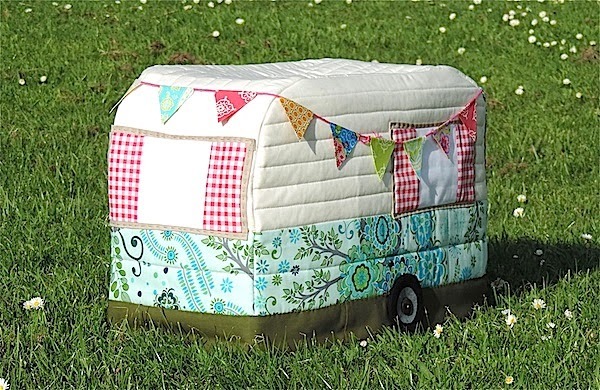 Cut one strip of your caravan solid fabric 32″ X 11″. Set aside. 10. 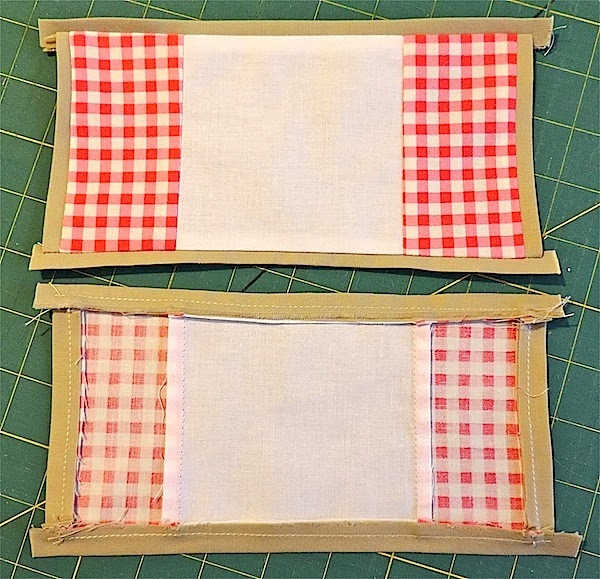 Cut two rectangles of your caravan solid fabric 22″ X 8 1/2″. Set aside. 11. 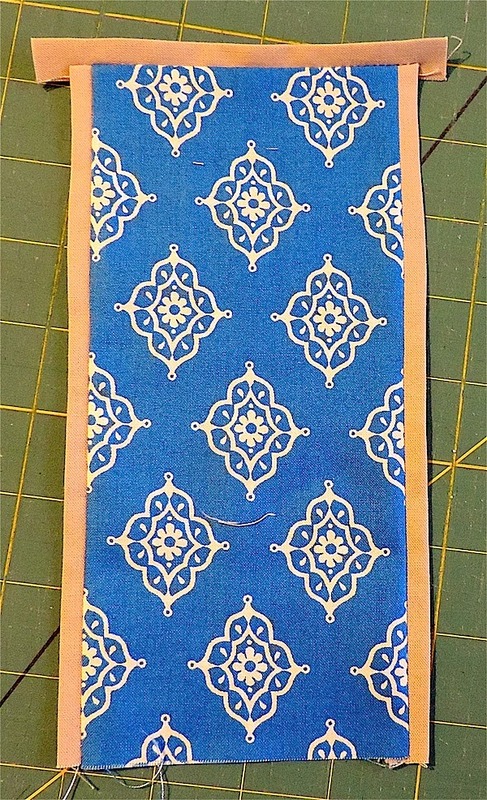 Cut two rectangles of your caravan print fabric 5 1/2″ X 11″. Set aside. 12. Cut two rectangles of your caravan print 22″ X 5 1/2″. Set aside. 13. Take one caravan solid fabric rectangle (22″ X 8 1/2″ – No. 10. above) and one caravan print fabric rectangle (22″ X 5 1/2″ – No. 12. above). Join, right sides together and press, as shown. 14. 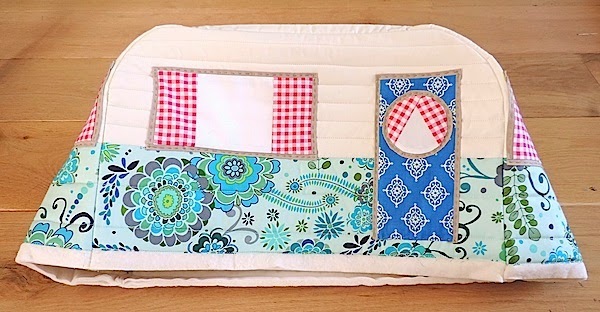 Make a quilt sandwich by layering one rectangle of backing fabric (22″ X 15″ – No. 7. above) right-side-down, then three rectangles of wadding (22″ X 15″ – No. 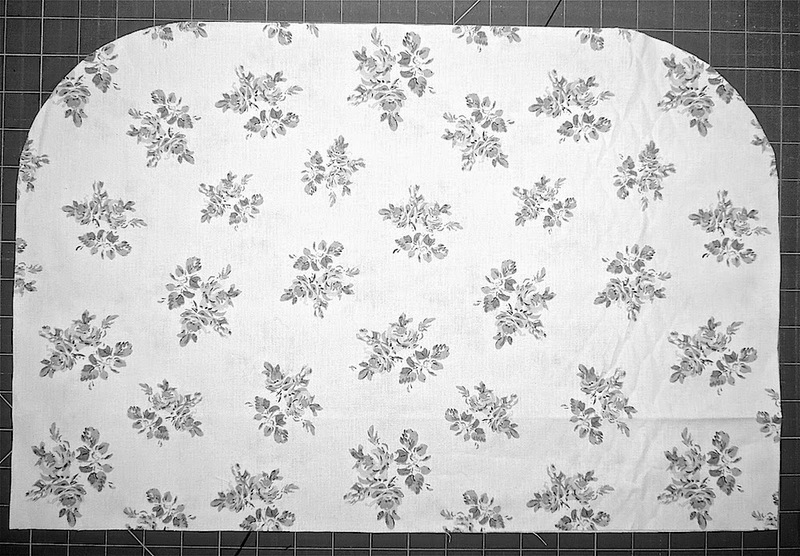 8. above) and, finally, the solid+print fabric rectangle you made in No. 13. above, right-side-up. 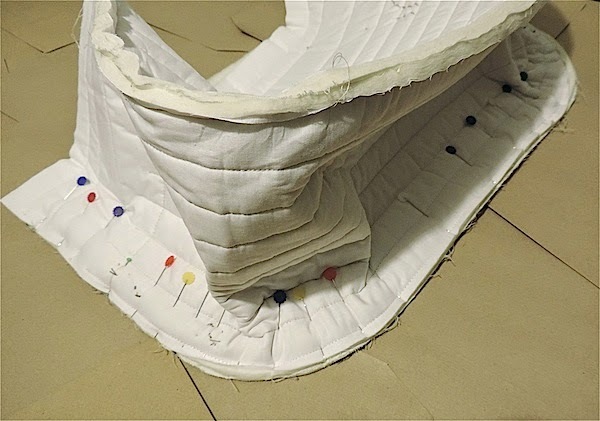 Align the top of the solid fabric with the edge of the wadding and baste. 15. Stitch in the ditch where the two fabrics meet and quilt the layers together. 16. 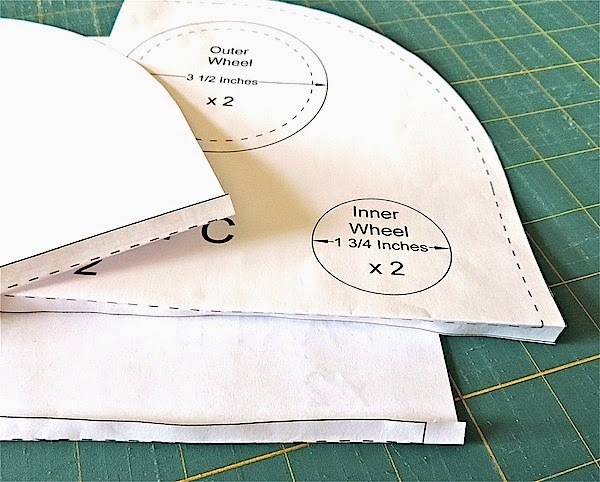 Take Pattern Pieces A, B and C and either cut off the bottom seam allowance or fold back the seam allowance along the sewing line, as shown. 17. 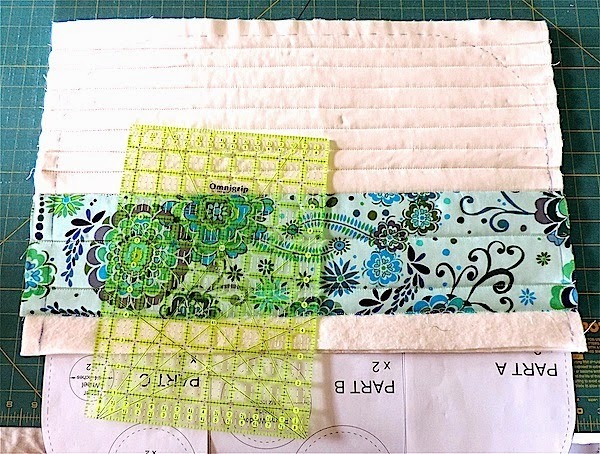 Align the bottom edges of Pattern Pieces A, B and C with the line where your two fabrics join and mark around them, as shown. 18. Continue your side marking to the bottom of the piece. 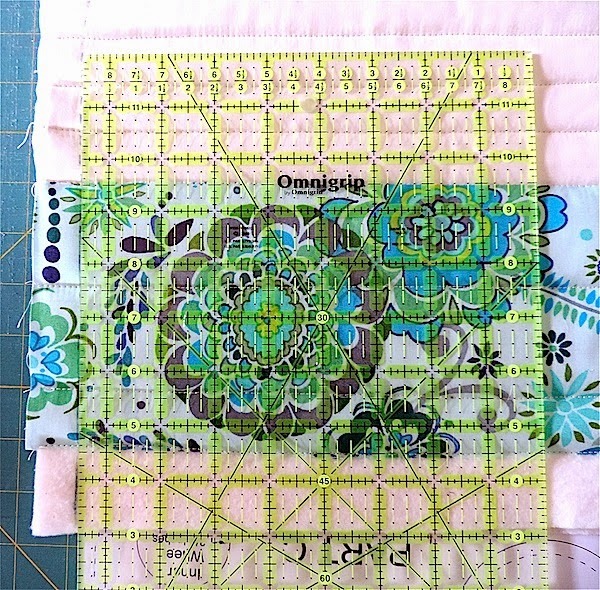 You can use a ruler to square up with your side marking and the sewing line where the solid + print fabrics join and, as an extra extra precaution, you can place the pattern pieces under the bottom edge of your piece to double check everything is correctly aligned. 19. 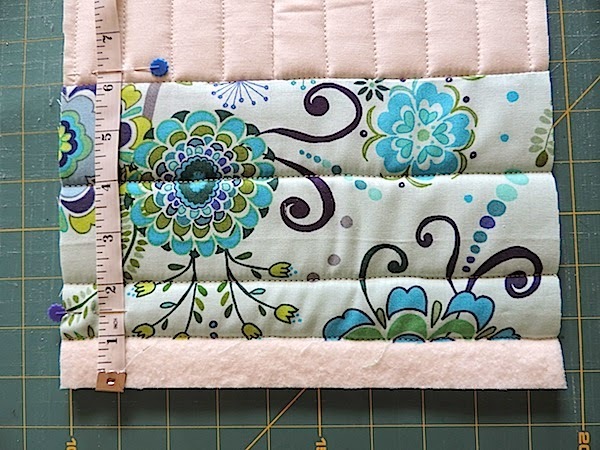 Trim the bottom of your piece 6″ from the sewing line where the solid + print fabrics join. This is 13 1/4″ from the top of your piece, as shown. Assembly – Side Two: As for side one. Repeat steps 13,14,15,16 above. 20. 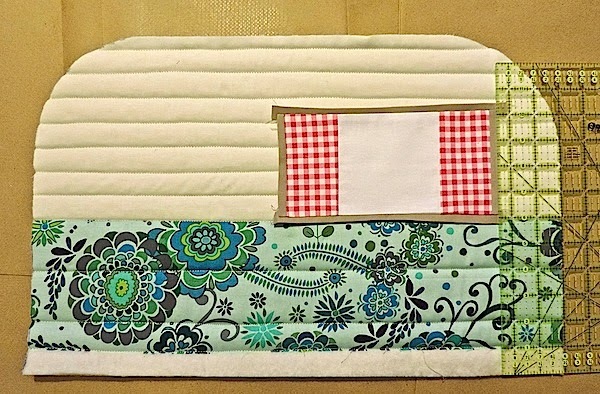 Make a quilt sandwich by layering the strip of backing fabric (44″ X 11″ – No. 7. above) right-side-down, then three strips of wadding (44″ X 11″ – No. 8. above) and, finally, your caravan solid fabric strip (32″ X 11″ – No. 9 above) right-side-up. 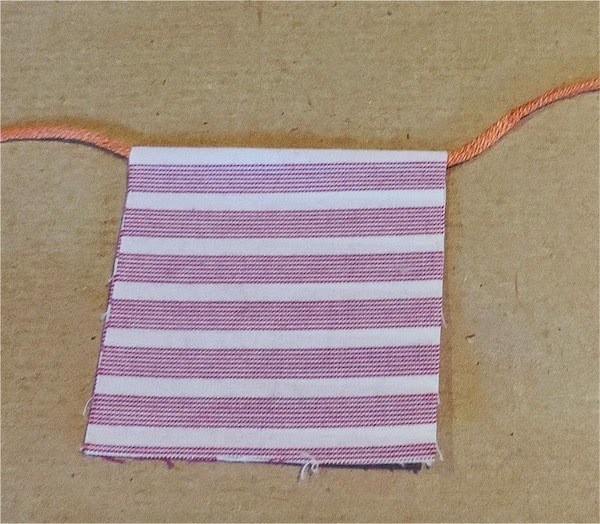 Align the centre of the solid fabric strip with the centre of the wadding strip. Baste and quilt. 21. Mark the centre of your strip with pins. Measure 15 3/8″ from each side of the centre line and mark using pins, as shown. 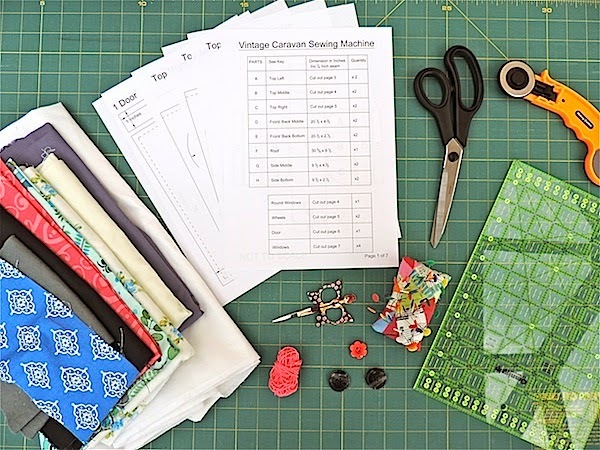 This gives your SEWING LINE. 20. 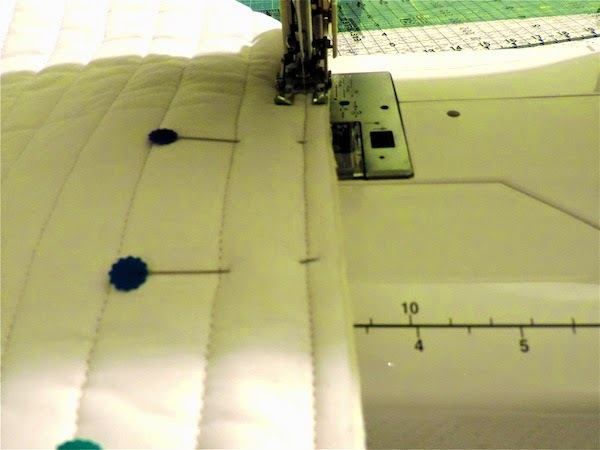 Mark a line across your piece 1/4″ away from and on the exposed wadding side of your sewing line (indicated by pins), as shown. Then remove these pins. 21. Take one caravan print fabric rectangle (5 1/2″ X 11″ – No.11. above) and lay it along your marked line (No. 20. above) wrong side up, as shown. 22. 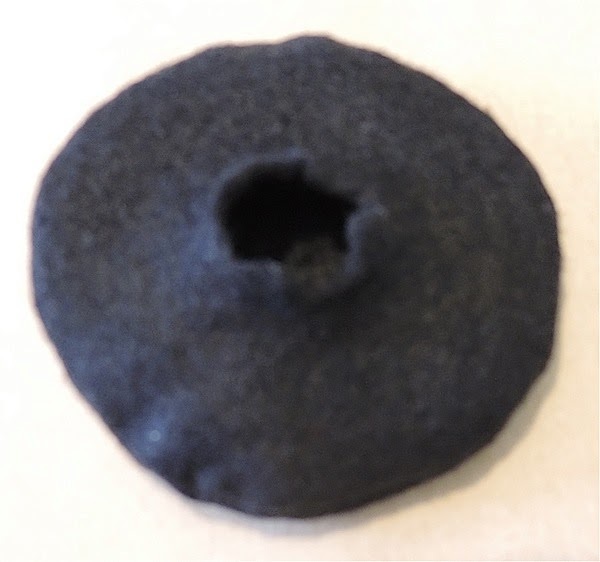 Pin and sew 1/4″ from edge, as shown. 23. Flip the print fabric rectangle over. 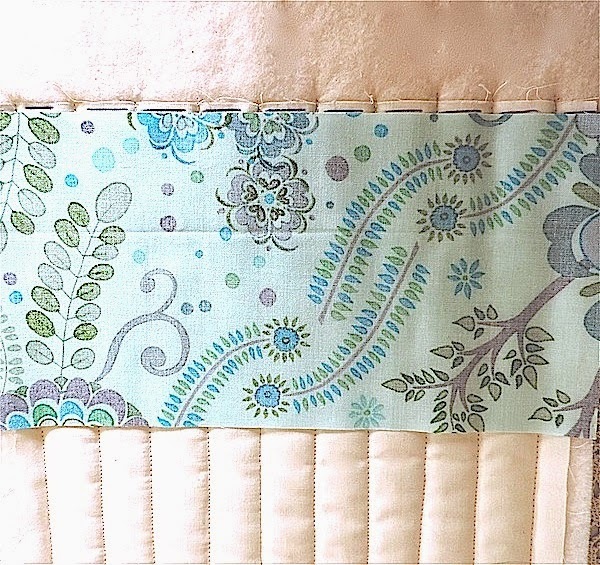 Press, Baste stitch in the ditch and quilt with lines 2″ apart. 24. 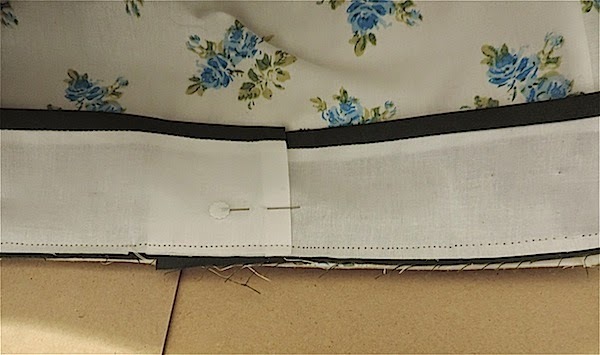 Trim the ends of your strip 6″ from the sewing line where the solid + print fabrics join, as shown. Repeat Steps 20, 21, 22, 23, 24 for the opposite side of strip. 25. 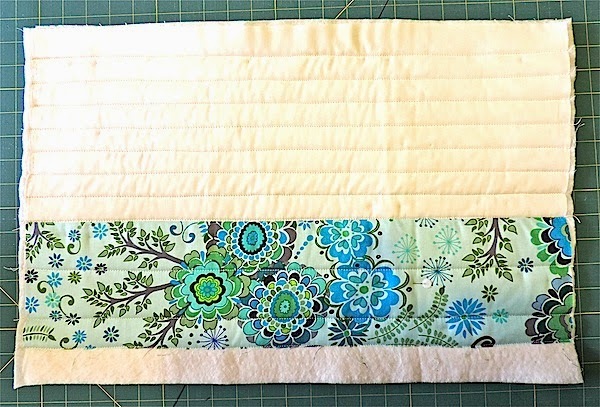 Trim sides of Strip to 9 1/2″ wide and set aside. 26. Take one Window Part 1 piece and two `window Part 2 pieces. 27. 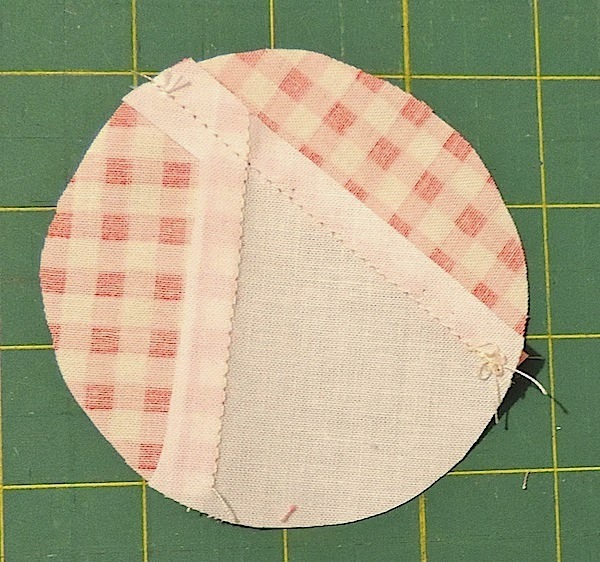 Join with 1/4″ seam and press seams away from centre, as shown. 28. Take two Window Part 3 pieces and two Window Part 4 pieces. Fold lengthways and press. 29. Sew the Window Part 3 pieces to the Window Part 2 pieces with raw edges adjoining, as shown. 30. Press seams towards centre, as shown. 31. Take two Window Part 2 pieces and sew to the top and bottom of window, as shown, ensuring you have a 1/4″ overlap at every side. 32. Press seams towards centre and set aside. 33. 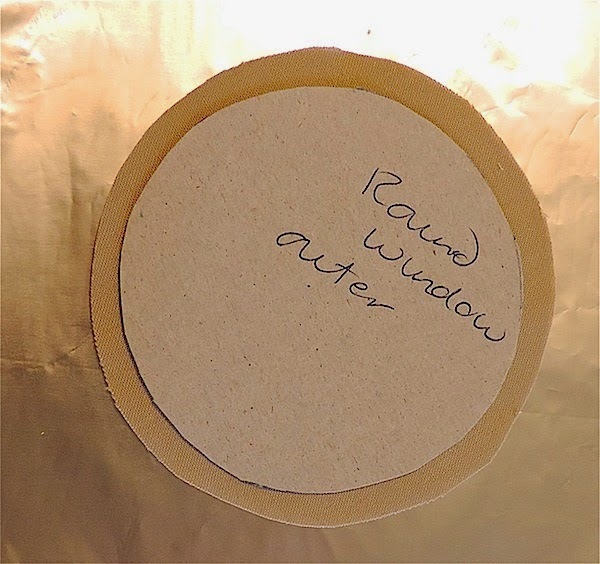 Take your smaller (3 1/2″) Round Window piece and one 3 1/4″ X 2″ rectangle. Lay the rectangle across the circle wrong side up, as shown. 34. 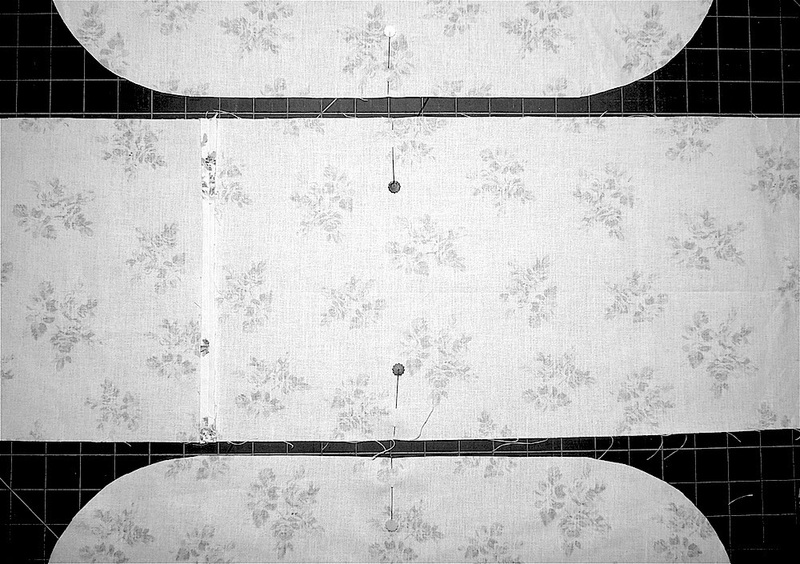 Sew with 1/4″ seam, as shown. 35. Flip over your rectangle and press, as shown. 36. 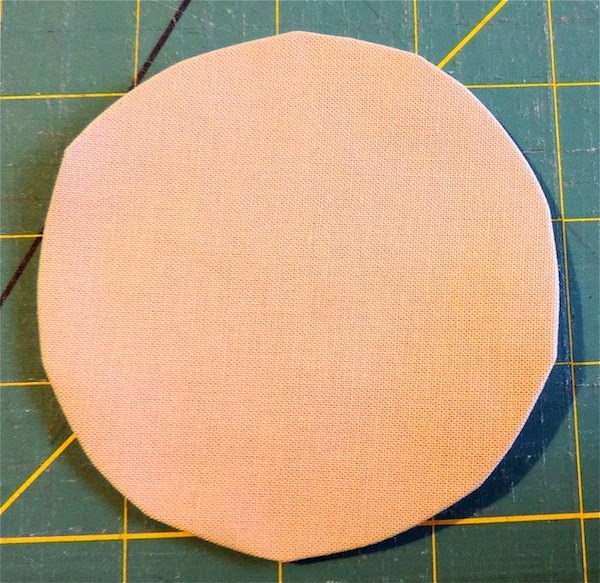 Turn over and trim your rectangle to match the edge of the circle, as shown. 37. Take your second 3 1/4″ X 2″ rectangle and position it wrong side up. 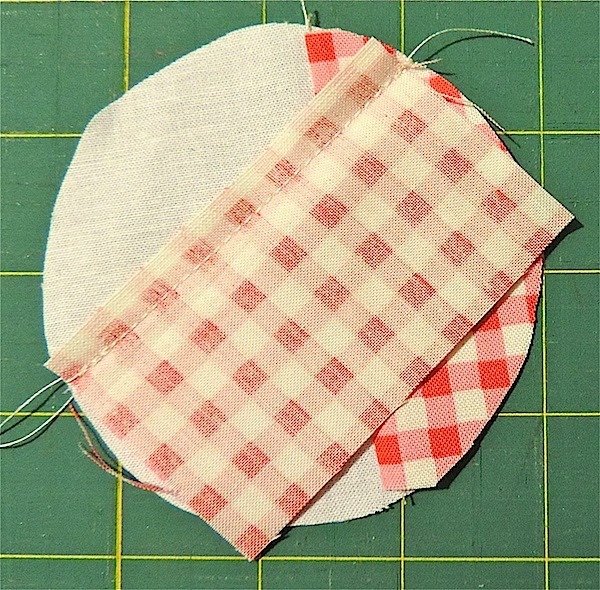 Position the rectangle so that one corner overlaps the piece sewn in step 34. above and one corner touches the edge of your circle, as shown. 38. 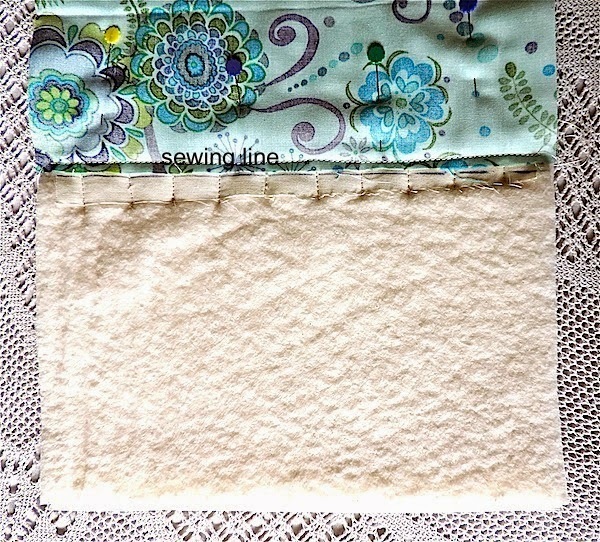 Sew with 1/4″ seam, as shown. 39. Repeat steps 35 and 36, as shown. 40. Trim away excess fabric from back, as shown, and set aside. 41. Go back to your Round Window paper pattern pieces. 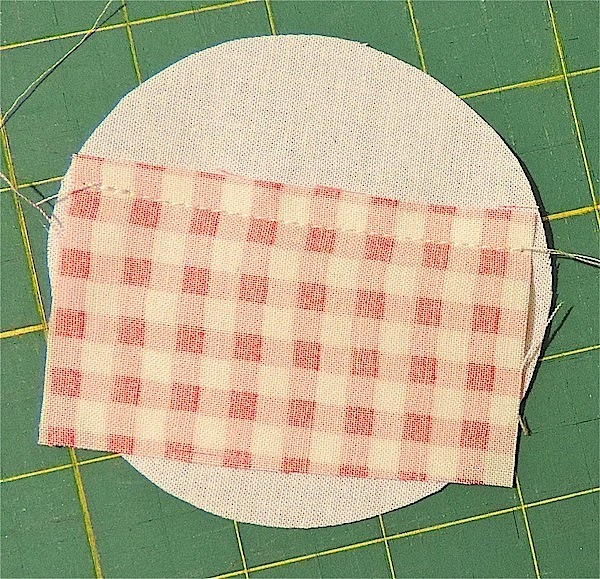 Cut off the seam allowance by cutting on the sewing line. 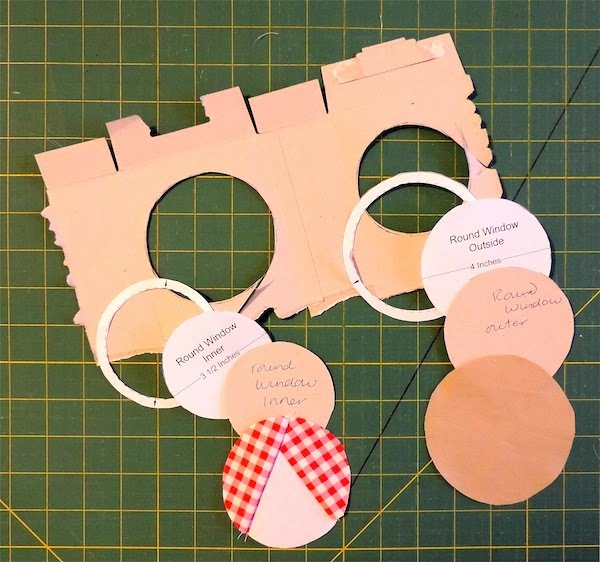 Using these as templates, cut circles from card, as shown. 42. 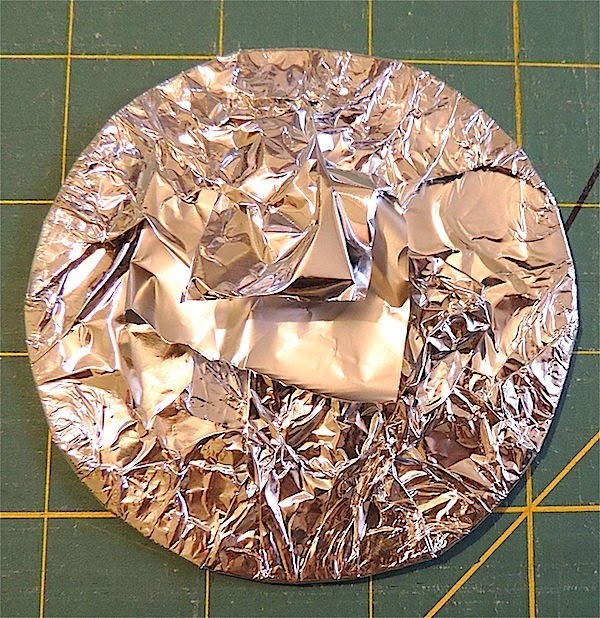 Take a piece of aluminium foil larger than your circles. 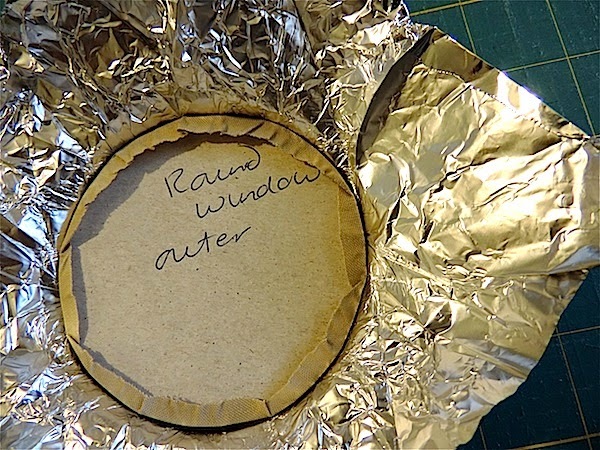 Lay your Outer Window fabric circle on the foil wrong side up. 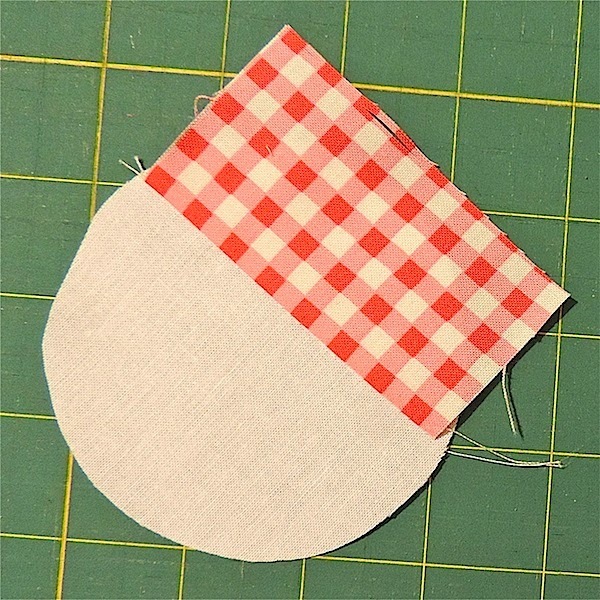 Lay your Outer Window card circle on the centre of your fabric, as shown. 43. Carefully fold your foil tightly over the edges of the card circle – this is folding the fabric edges at the same time – and press. 44. 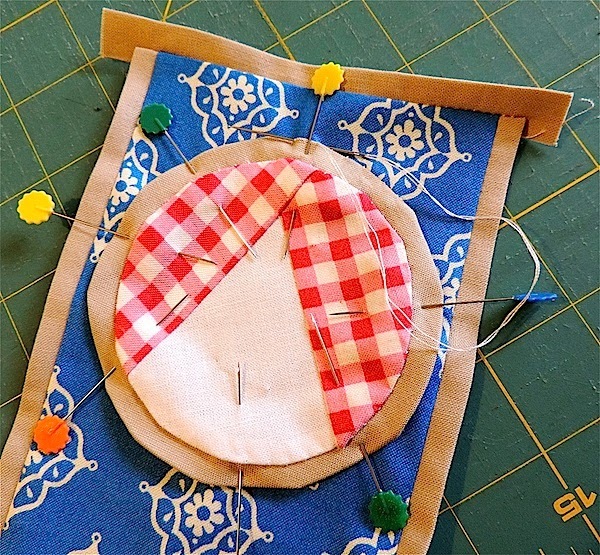 Separate your foil, card and fabric carefully and set aside your fabric circle. 45. Repeat steps 42, 43 and 44 using your Inner Window piece from step 40. 46. Sew your Inner Window onto your Outer Window. 47. Press and attach each Door Part 2 to the sides of Door Part 1 in the same way as steps 29. and 30. above. 48. Press and attach Door Part 3 to Door in the same way as steps 30. and 31. above. 49. 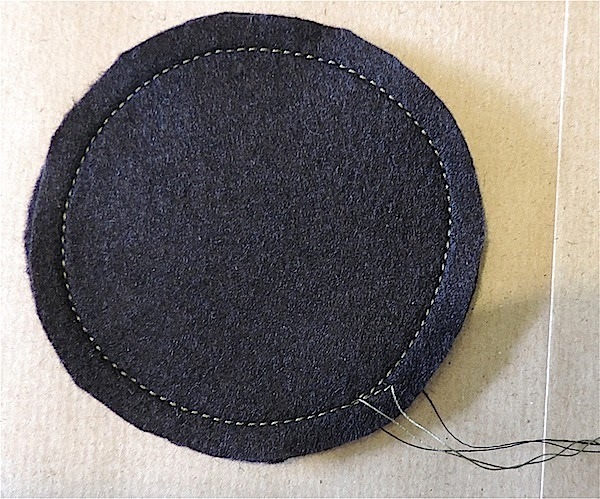 Take the Round Window you made in Stage Four and hand or machine stitch onto door as shown. 50. Take one side of your Caravan. Position the bottom of your door 1 3/4″ from the bottom and 2 1/2″ from the right and position the bottom of your window 5 3/4″ from the bottom and 2 1/2″ from the left, as shown. 51. Take the other side of your caravan and position the bottom of the window 5 3/4″ from the bottom and 2 1/2″ from the right, as shown. 52. 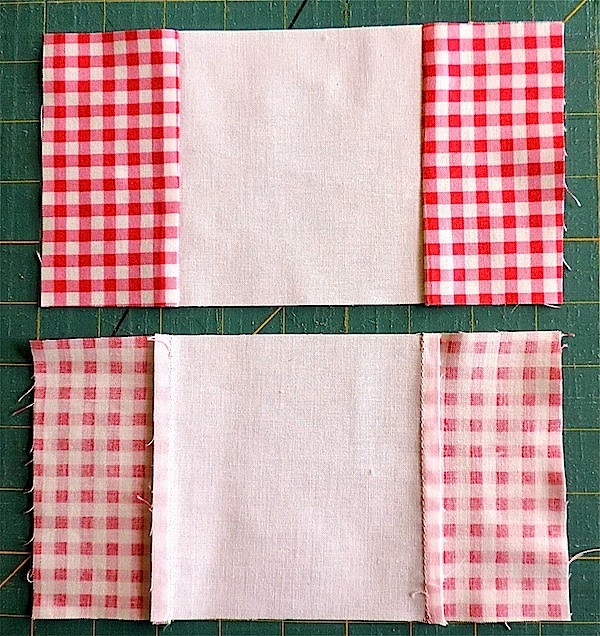 Take the remaining strip of your Caravan and position one window at each end. Position each window in the centre of the strip 5 3/4″ from the end, as shown. 53. Stitch your windows and door in place by hand or machine, turning under and securing the edges of your door and window frames, as shown. 54. 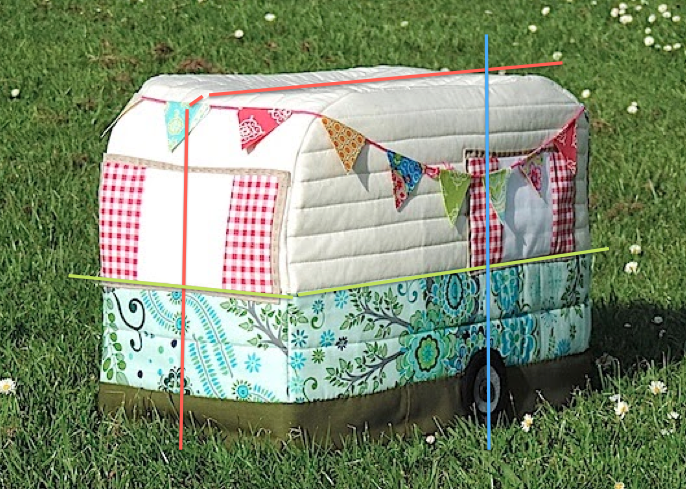 Take the centre strip of your Caravan and one side piece and pin them right sides together. Take special care to ensure that the corners where the solid and print fabrics meet is aligned. 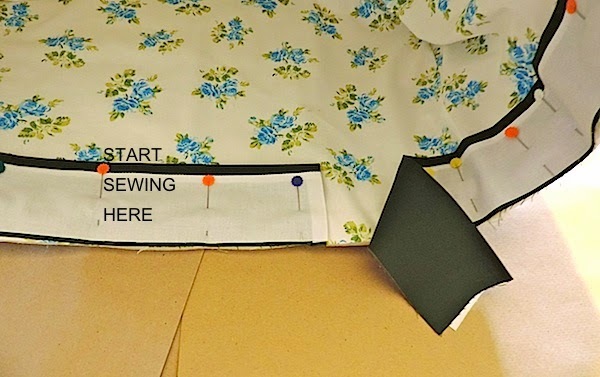 There will be clear stitching lines indicating this on the wrong side of your pieces where you stitched in the ditch. 55. 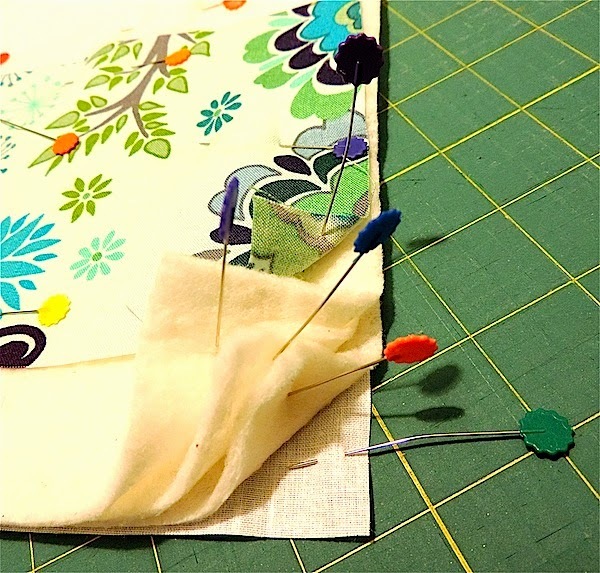 Sew carefully around your pinned edge, removing pins as you come to them. 56. 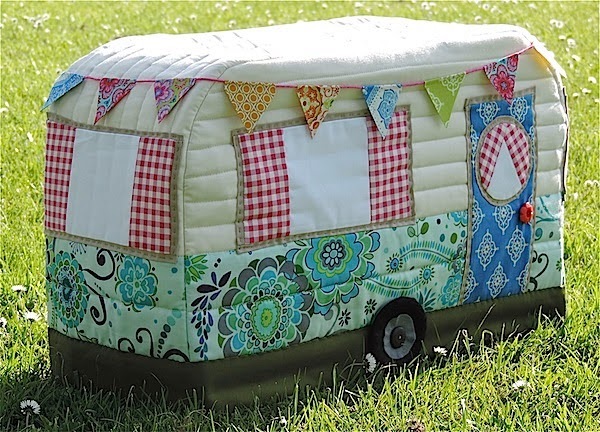 Attach the second side of your Caravan, repeating steps 54 and 55. 57. Turn your piece right side out. 58. 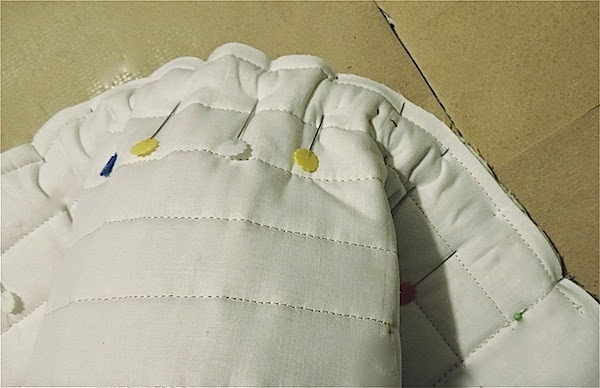 Position lining inside your cover and pin as shown and secure to the top corners of your cover with some small hand stitches. 59. 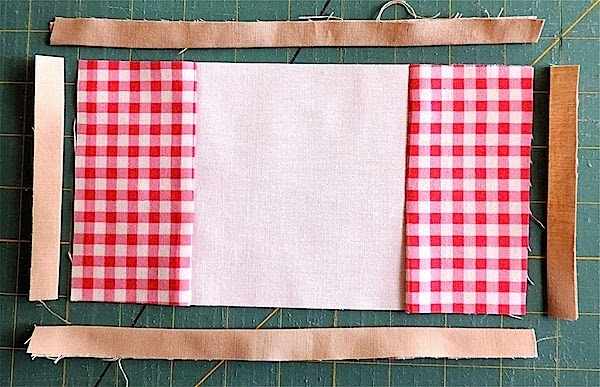 Prepare a strip of background fabric 60″ X 5″ and press lengthwise. 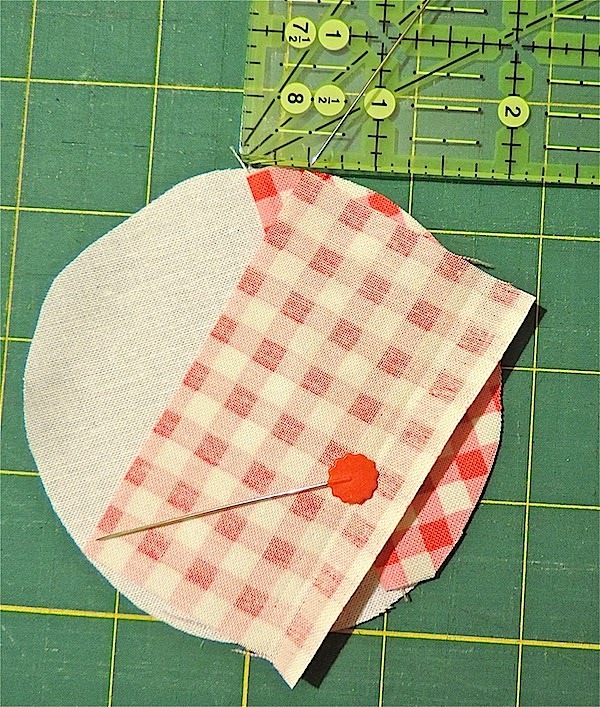 Fold over one end approx 1/4″ and press. PLEASE PRETEND THIS STRIP IS ALL GREEN! 60. 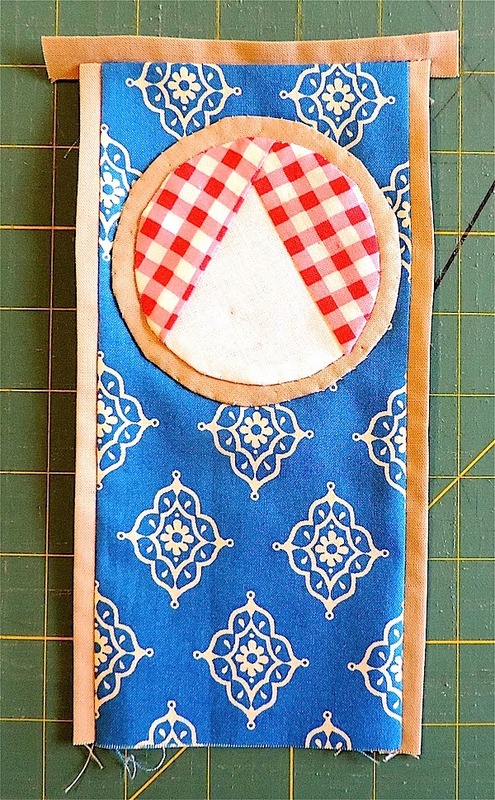 Align your background strip with the bottom of your lining, raw edges together, and pin in place. Work clockwise beginning with your folded end. 61. 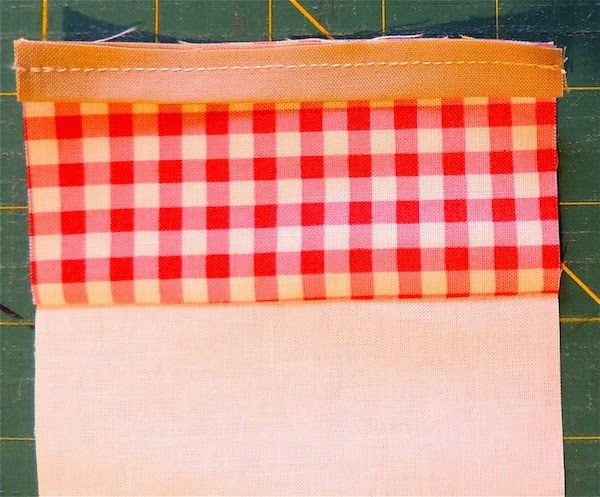 Starting about 4″ from your folded end, sew with a 1/4″ seam until you get to about 4″ from your folded end, as shown. 61. 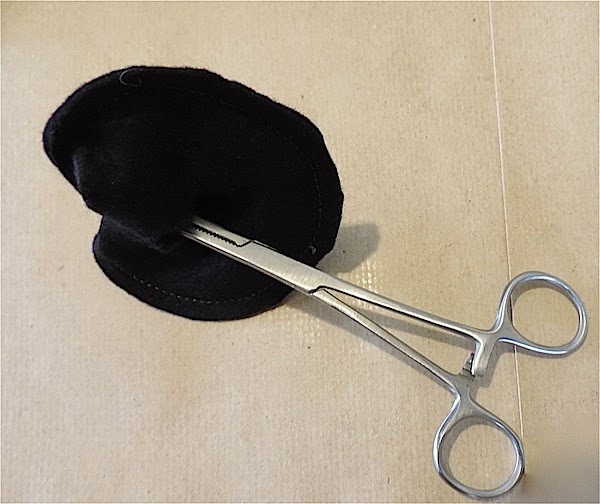 Unpin your folded end. Lay your raw edged end inside the folded end, as shown. 62. Continuing sewing until your strip is secured right around. 63. 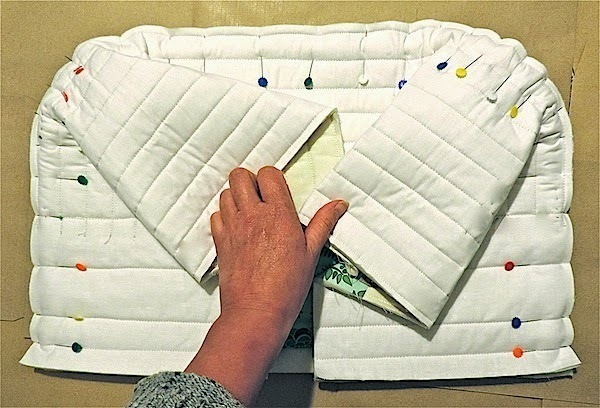 Fold your strip to the right side of your cover. 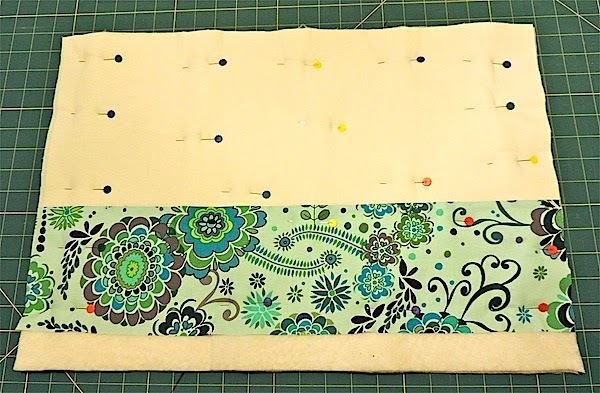 Pin and slip stitch to right side just above your second quilting line, as shown. 64. 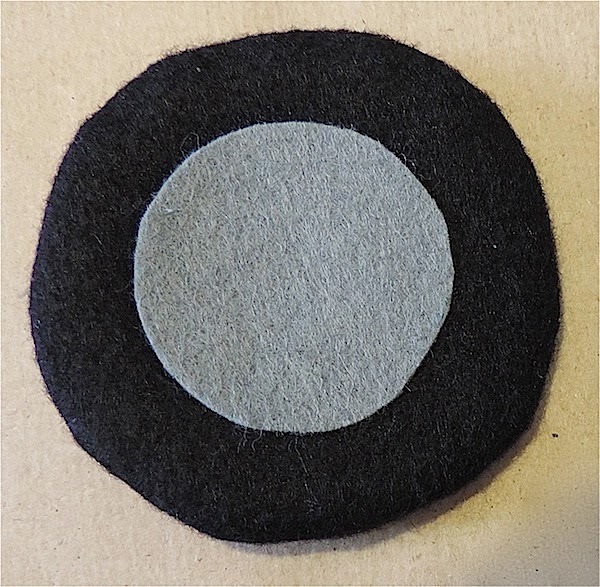 Take a rectangle of grey felt and iron on a 5″ X 2 1/2″ of fusible fabric. 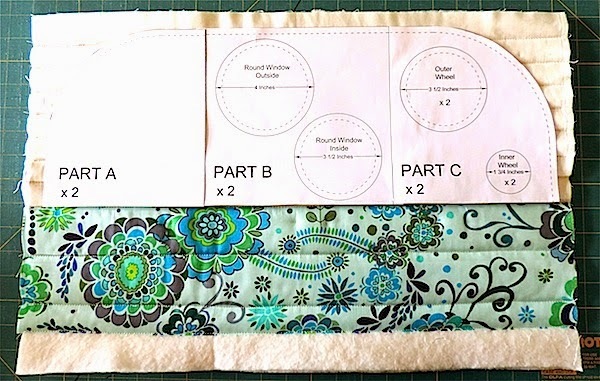 Then take your Inner Wheel template from page 5 of your Pattern and Draw around it twice. 64. Cut out your circles. 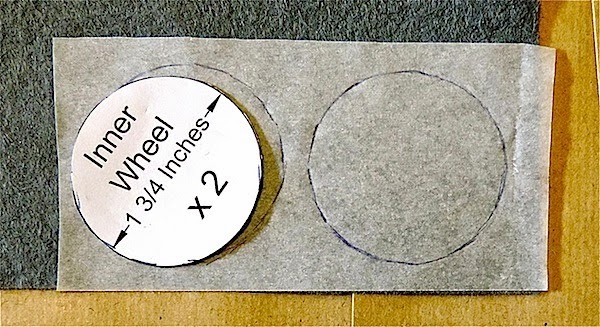 Score across the fusible paper backing with a pin to remove it without damaging the edges of your circle. 65. 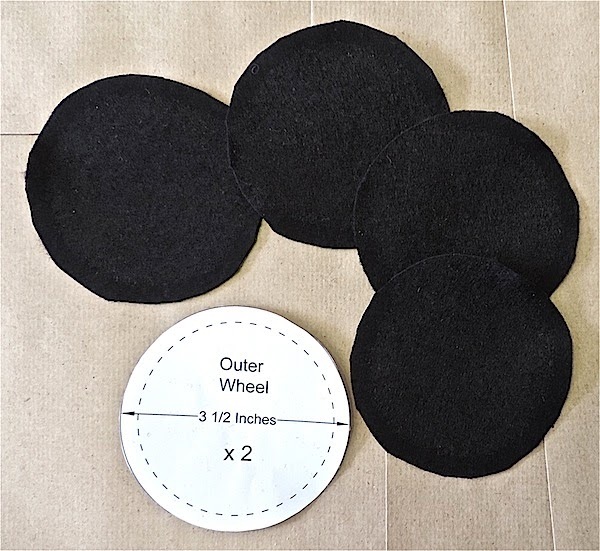 Take your 9″ square of black felt and cut four circles, using the Outer Wheel template from page 5 of your pattern. 66. 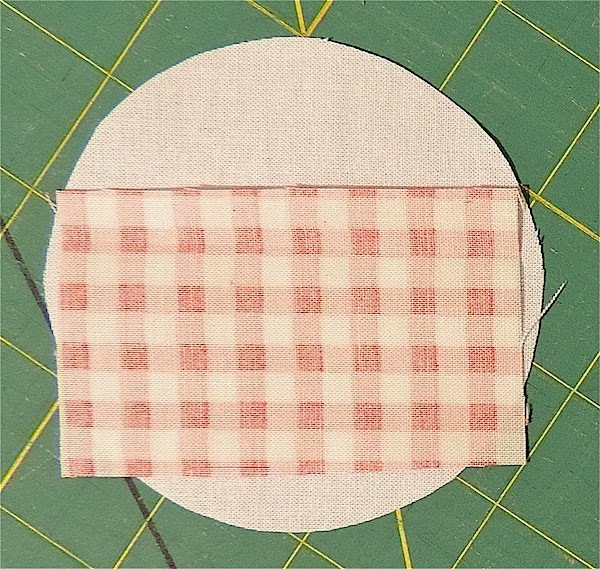 Sew around the edge with 1/4″ seam allowance, as shown. 67. 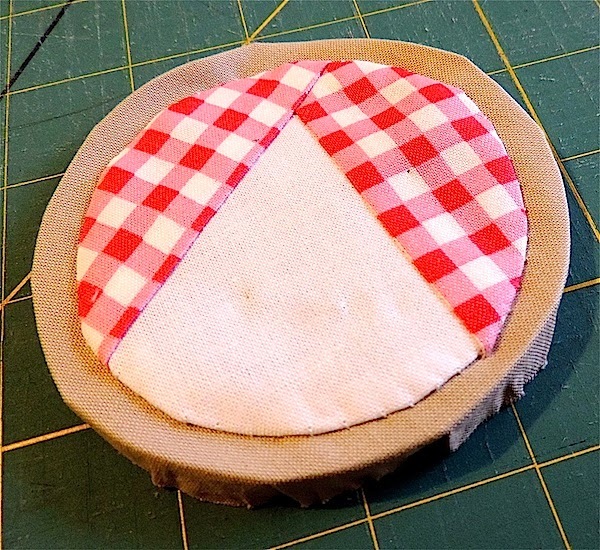 Pull apart the two sides of your Wheel and cut a small hole in the centre of one side. 68. Turn your Wheel right side out by pulling the seams through your centre hole. 69. Iron your Inner Wheel (made in steps 64. and 65. above) over the hole in the centre of your Outer wheel. 70. Position your Wheel in the centre of your Background Strip. 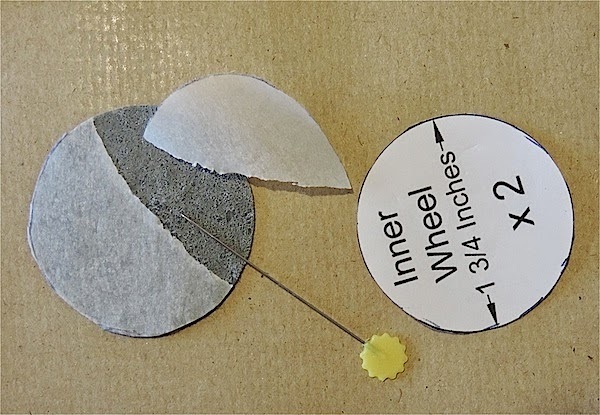 Sew your Wheel onto your Caravan, attaching a Button to the centre at the same time. 71. 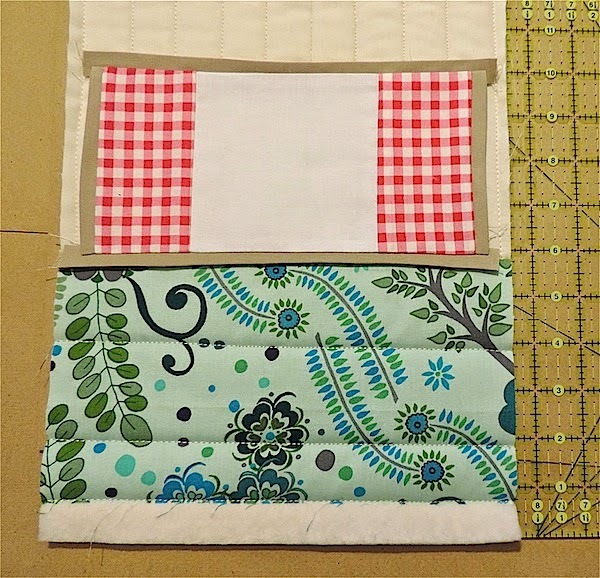 17 x 2″ X 4″ scraps of fabric and iron onto fusible fabric. 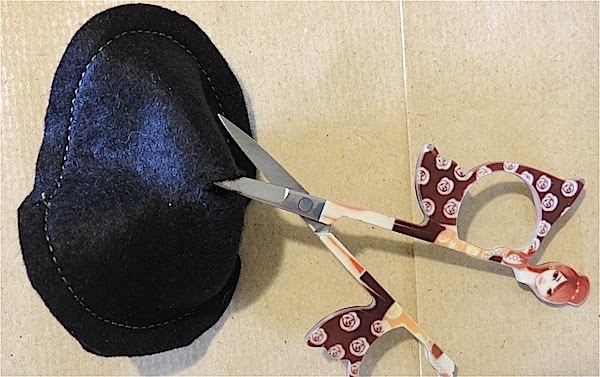 Remove the paper backing from each piece. 72. Take your 56″ length of yarn. Leaving approx 1 1/2″ at each end of the yarn, space your rectangles evenly with the yarn lying over the centre of each piece, see below. 73. 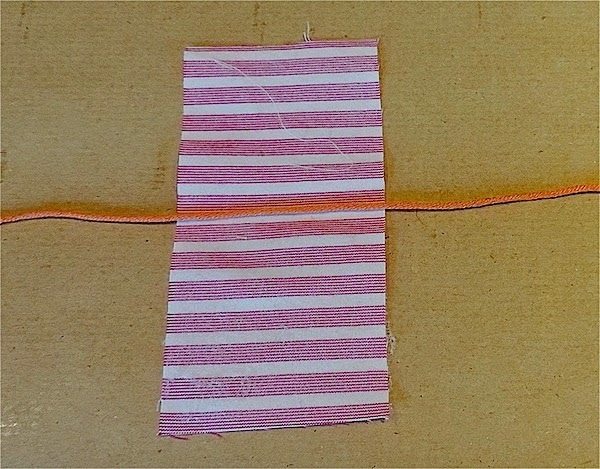 Fold your rectangle in half over the yarn and press, as shown. 74. 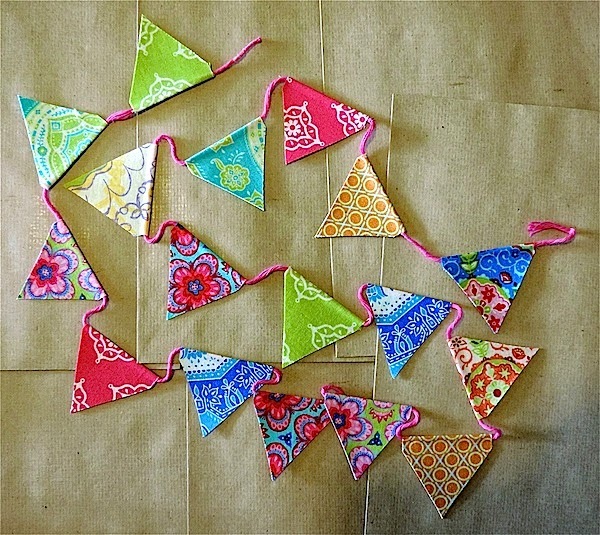 Trim your bunting flags to shape. 75. 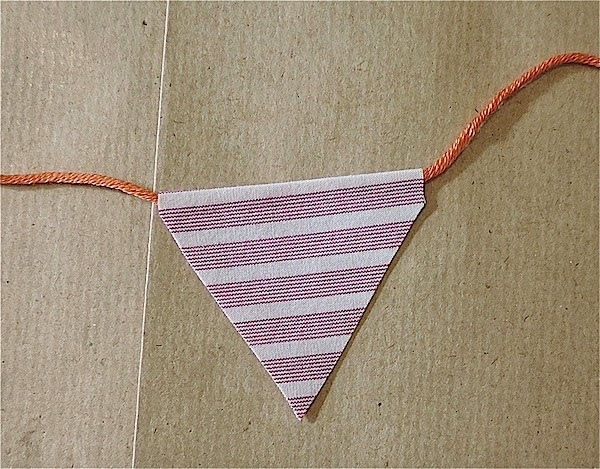 Arrange your Bunting on your Caravan Roof as desired and secure the corners with small hand stitches. I recommend using Soft and Stable from ByAnnie for sturdiness without the bulk. You can easily sew through it and it’ll stand up! I have shopped for and picked out the fabrics and I was wondering do you prewash your fabrics before you use them? Thanks for the adorable idea love it! I absolutely love this pattern! 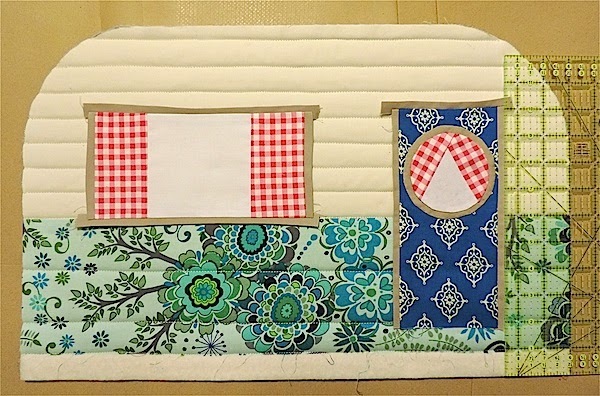 We have a vintage camper, and I am anxious to get started on this adorable cover. My question: How can. I make a hole in the top for the handle to come through? Thanks!! I purchased the pattern on Etsy for myself and I have a person who wants me to make one for them. They would pay me. Is this allowed? This is absolutely adorable! I can say that, as I grew up Building the Real campers! My Sister and I were raised as our Father’s sons. we handled routers, nail guns and staplers as professionals of our craft and I am Sad to say we didn’t get to keep any of these Rosscraft Travel Trailers for ourselves. 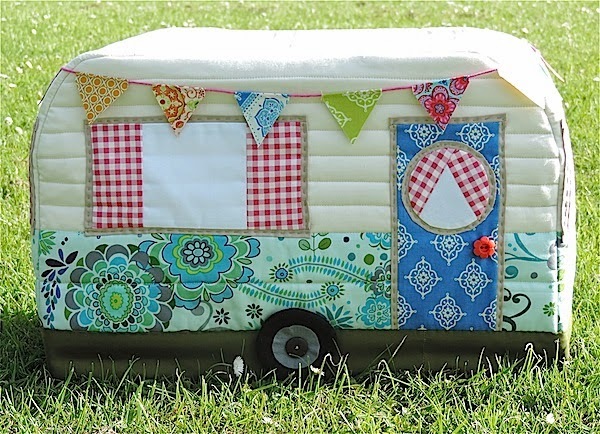 So now I indulge myself by making camper replicas in fabric. Thank you for such a cute project! I am soooo excited to try this! My machine sits in a public area of our house and this is the perfect solution! 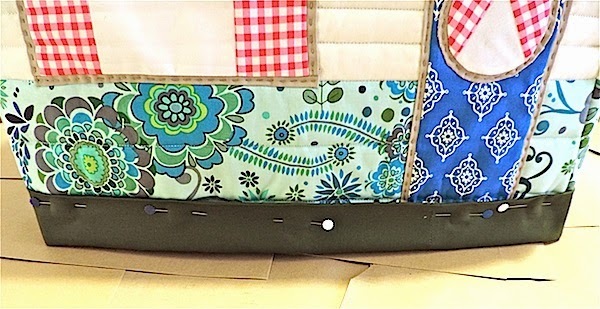 I made a tool apron using a caravan inspired fabric and this will be the perfect companion piece. But it will have to wait until after Christmas. I made the pattern minus the flags and I’m looking for buttons to put on a place for my wheels. I love my caravan. 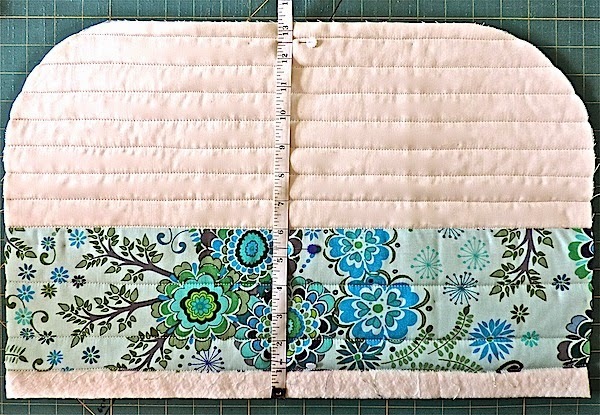 Great cover for my machine and I’m thinking of making a second one for my other machine or modifying it to make a cover for my serger. This is adorable!! I can’t wait to try it! What is wadding? Is it the same as batting? How thick is it? Thanks!!! I love this cover! Can’t wait to make one! Thanks for sharing. I have not made this yet but you asked for suggestions and I was thinking that using Annie’s soft and stable would work well. 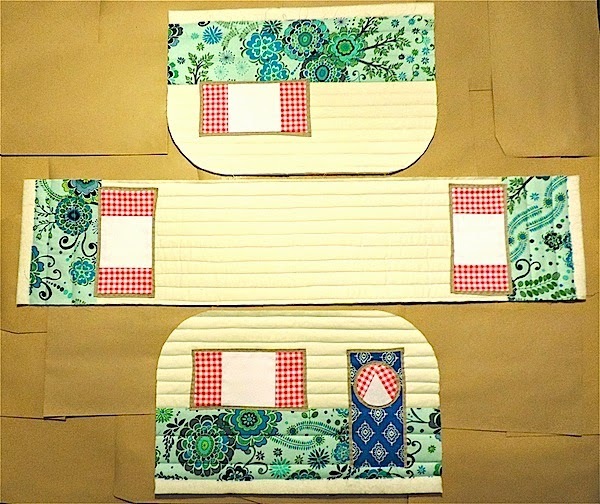 I have made some of Annie’s patterns and she quilts the outside and the lining together then puts binding on the exposed seams to cover them. I really think it would be perfect for this pattern. Awesome! 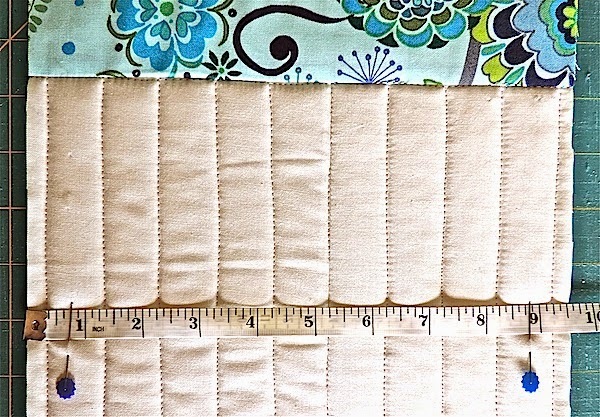 Just one question: how can I readjust the sizes if my machine is bigger? I have a question about the Two Buttons to back Wheel Buttons. I am not clear on how those get attached to the Wheels? Can you describe where to place them? I’m about to purchase this pattern from your Etsy shop. I have a couple of questions. Do you have to include the lining? 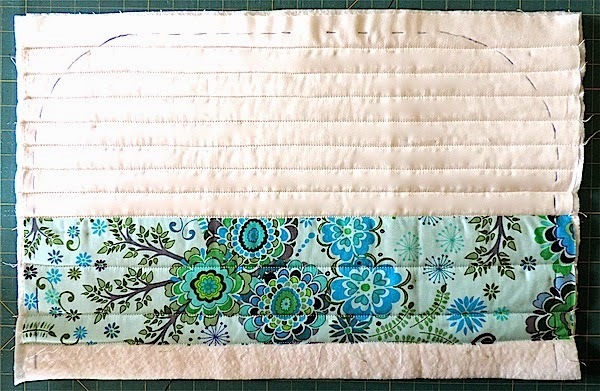 I would have to include the finishing strip on the bottom, but could I skip the lining? Also, I wanted to include a hole in the top so the carry-handle of my sewing machine could pop through. Have you heard of anyone doing this before? I made it and did not use the lining. It worked out! I love it. My girlfriends and I are going to make one. This is absolutely darling Janine! You did such a great job with it and I love all the cute details you added! Your instructions look fantastic! I love old caravans too. 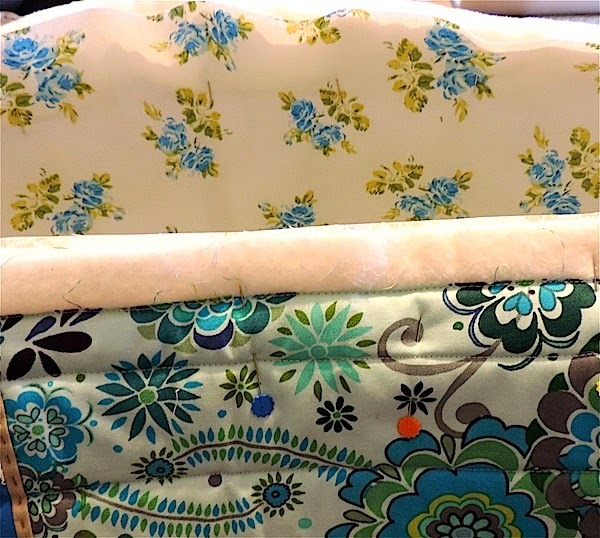 I made a cottage sewing machine cover (when writing my book) and found that using Lazy Girl Designs “Stiff Stuff” worked very well as structural support. There is another product called ByAnnies Soft and Stable that I would like to try too. I made one for my sister for Christmas. She loves it, and now I'm going to have to make one for myself! If I had any idea how to upload a picture, I would. Thanks for the adorable pattern! Beyond adorable! However, I have Juki – huge – perhaps a Mac truck or double decked red bus would suit my machine better. Thank you for such a cute project with the terrific tutorial. I am excitedly looking forward to making one soon. Started to reply Great Idea when I realized the info is from you Marti! Now I know it is a really Great idea! I can't get over how stinking CUTE this is! Thank you for the awesome pattern and tutorial. I'm sharing this with my Mother-in-law because it is absolutely perfect for her.